"Thursday with Helenna and Alex" by Phylliss DelGreco, Jaclyn Roth et al. In "Thursday with Helenna and Alex," Jessie has a play date with two of her best friends. As the children conduct an "archeological dig" in Helenna's backyard (with the energetic and hilarious help of Buddy, the dog), they uncover some surprising artifacts and discover the real key to their friendship. 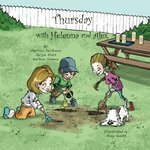 "Thursday with Helenna and Alex" is the fourth book in The Jessie Books series, which offers an inspiring story for each day of the week, featuring a precocious little girl who lives with her two moms in Queens, New York. DelGreco, Phylliss; Roth, Jaclyn; and Silverio, Kathryn, "Thursday with Helenna and Alex" (2012). DIVerse Families. 440.